On 14th February 2018, Wales joined the many hundreds of thousands of others across the globe in raising awareness of rare diseases and the commonalities of experience that create our cohesive rare disease community. Rare Disease UK, a campaign established by Genetic Alliance UK, holds an annual reception in the Senedd to bring stakeholders together including patients, families & carers, third sector organisations, health and social care professionals, policy makers, scientists, drug developers, commissioners and regulators to mark this occasion. The event ensures that the voice of people affected by rare, genetic and undiagnosed conditions is focal to discussions driving forward policy and service development. The reception included presentations on the Welsh Implementation Plan for Rare Diseases, the Genomics for Precision Medicine Strategy, a personal experience of the rare condition Williams Syndrome and the official launch of the 100,000 Genomes Project by the Cabinet Secretary for Health and Social Services, Vaughan Gething. There was also an opportunity for attendees to view two exhibitions – the Rare Beauty exhibition by Welsh photographer Ceridwen Hughes, and the Expressions of Hope exhibition, a collection of art work by patients and family members affected by lysosomal storage disorders. Darren Millar AM opened the reception and welcomed guests. As Shadow Secretary for Education and Children in the Assembly, Darren has a good understanding of the issues affecting those with rare and genetic conditions and is passionate about making them a priority within the Welsh NHS. Dr Jayne Spink, CEO of Genetic Alliance UK, spoke about the Welsh Government Implementation Plan for Rare Diseases which was launched in 2015 and has since been updated to address how the 51 commitments within the broader UK Strategy will be implemented locally. Jayne highlighted that Genetic Alliance UK is fortunate to work within the Wales Gene Park – and the enormous benefit this brings with respect to the role of the organisation in supporting the delivery of the Welsh Implementation Plan and Genomics for Precision Medicine Strategy. Jayne also stated that in Wales, Genetic Alliance UK is planning to establish a Cross Party Group in the Assembly for Rare, Genetic and Undiagnosed Conditions which will bring the issues of patients and families to parliamentarians to ensure they are prioritised. 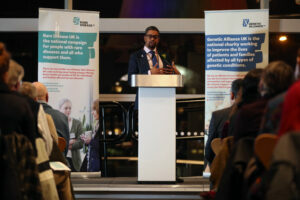 Cabinet Secretary for Health and Social Services, Vaughan Gething launches the 100,000 Genomes Project in Wales at the Rare Disease Senedd Reception. Cabinet Secretary for Health and Social Services, Vaughan Gething highlighted the Welsh Government investment in the New Treatment Fund which has recently benefited early access to a new medicine for Fabry patients in Wales. He went on to formally launch the 100,000 Genomes Project in Wales following which, Professor Julian Sampson spoke about the benefit of the project to rare disease patients. Dr Graham Shortland provided an update on progress delivering the Welsh Implementation Plan for Rare Diseases and Sarah Bennett-Evans, mum to 4 year old Harrison, gave an emotional personal perspective about the effect of the rare condition Williams Syndrome on their family and the work she does to raise awareness through the Williams Syndrome Foundation. L to R: Sarah Bennett-Evans, Professor Julian Sampson, Darren Millar AM, Jayne Spink, Dr Graham Shortland. 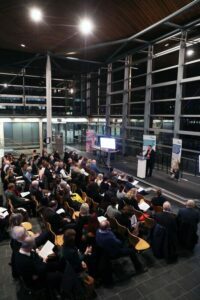 The event provided an excellent opportunity for stakeholders to learn about how patients who have an undiagnosed genetic condition can benefit from taking part in the 100,000 Genomes Project, more information about which can be found in the official announcement from the Welsh Government published following the launch. 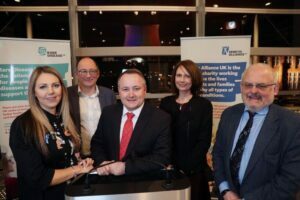 More information about the work of Genetic Alliance UK and it’s collaboration with the Wales Gene Park can be found here.